With some formulas (Black frame) the appropriate on-line computation assistance can be opened by clicking on the formula window. Using the gas laws can be converted to any operating condition in the standard state of DIN1343. I.e. if you know the current environmental conditions and the current gas temperature, it is easy to convert the mass flow into the volume flow and vice versa. For simplicity, only the gas temperature and the ambient air pressure approach taken. 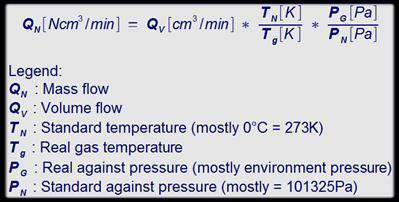 If necessary, also other data such as the saturation pressure or relative humidity are used. In a real supply of compressed air refrigeration dryers, these parameters have only a minor role. Result: The mass flow is around 10% smaller than the volume flow.